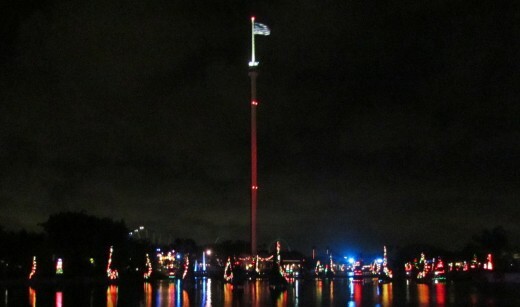 The 2012 Edition of Seaworld’s Christmas Celebration is back and better than ever. They’ve expanded the Sea of Trees and added lots of little touches that make the evening special. Add to that all the returning favorites and it’s clearly one of the best deals in town for holiday fun. Events take place on select dates November 17 through December 31, 2012 and, for the most part, are included with park admission. New this year is Show Express, which provides guests with reserved seating at all of SeaWorld’s Christmas Celebration’s shows, plus front-of-the-line access to THE POLAR EXPRESS Experience, All-Day Dining Deal and a complimentary holiday photo. In addition to the incredible seasonal shows and attractions, the amazing Sea of Trees includes more than 100 massive trees, each sparkling, lighted and choreographed to classic holiday tunes, making a dramatic display around SeaWorld’s center lake. The Christmas Market, located on the park’s Bayside Pathway, features unique artisans and culinary delights. 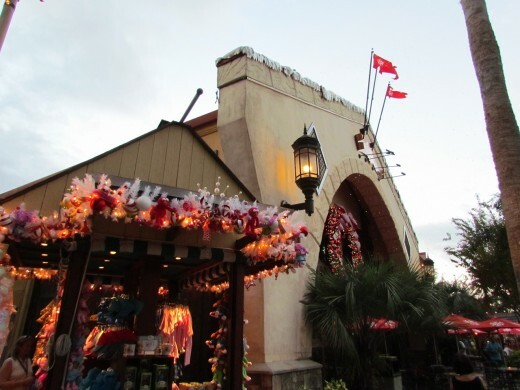 At this festive, bustling market, guests can find one-of-a-kind gifts and dine on scrumptious holiday delights. O Wondrous Night tells the greatest story never told, with more than 30 carols, based upon the Christmas Story and told through the eyes of a variety of live animals. Everyone will be entertained by this touching, light-hearted and glorious celebration featuring a host of angels, animals and the true glory of Christmas. And new this year, guests will have the opportunity to take photos with some of the stars from the show! Winter Wonderland on Ice is an ice skating extravaganza where Christmas comes to life through towering water fountains, magnificent fireworks and some of the most talented ice skaters in the world. This is a don’t-miss, holiday sensation. 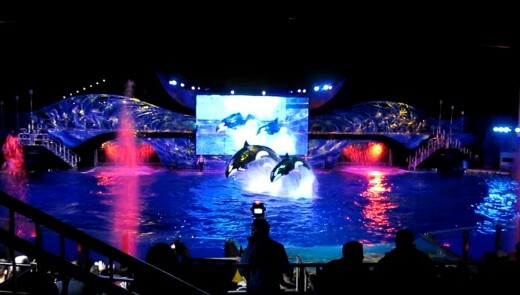 SeaWorld invites guests to experience the grace and beauty of our Shamu family at Shamu Stadium, during the night-time show, Shamu Christmas…Miracles. Thrilling seasonal music rings out as whales soar through the air in a performance that will take the audience on a stirring voyage into the heart of the holidays. Clyde and Seamore’s Countdown to Christmas features Santa’s helpers, Clyde and Seamore, who are bringing their own brand of comedy to Christmas this year. Our loveable sea lions, along with a few mischievous otters, a comical elf, and a wintery walrus or two, search for Santa. A Sesame Street Christmas is a festive and fun musical celebration that will have the little ones smiling all the way home. Through dance, laughter, and interactive sing-a-longs, Elmo, Telly Monster and the rest of Abby Cadabby’s Sesame Street friends teach her what Christmas means to them. SeaWorld celebrates the season during Holiday Reflections: Fireworks and Fountains Finale, with soaring fountains, dazzling lights, and festive fireworks, choreographed to joyous holiday musical favorites. Experience a wondrous SeaWorld Christmas connection that lights the night. All Aboard! At the park’s Wild Arctic attraction, guests embark on a heart-warming journey to the North Pole aboard THE POLAR EXPRESS Experience, based on the film from Warner Bros. Pictures and Shangri-La Entertainment, inspired by the beloved Caldecott Medal children’s book by Chris Van Allsburg. Discover the sights, sounds, and smells of the season as family and friends are immersed in the dazzling wonder of this beloved holiday classic. Upon arrival at the North Pole, guests can meet Santa Claus himself, and encounter astounding animals in a wintery wonderland. THE POLAR EXPRESS Experience is based on the film from Warner Bros. Pictures and Shangri-La Entertainment, inspired by the beloved Caldecott Medal children’s book by Chris Van Allsburg about a young boy doubting the magic of the holidays who takes an extraordinary train ride to the North Pole on Christmas Eve. He embarks on a journey of self-discovery that shows that the wonder of life never fades for those who believe. Finally, enjoy a delicious dinner of Christmas favorites with Santa and Mrs. Claus during Santa’s Fireside Feast, a charming, warm-hearted holiday experience. Meet Santa himself, and listen to a classic holiday poem told onstage as never before to create Christmas memories that will last a lifetime. This sumptuous, all-you-can-eat seasonal meal takes place weekends of SeaWorld’s Christmas Celebration. Reservations are required, and include reserved seating at select holiday shows.